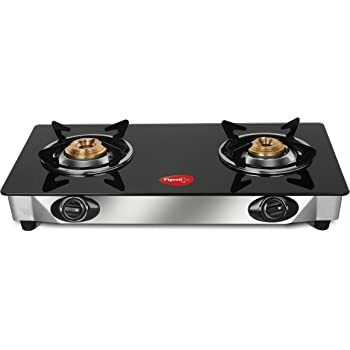 Buy Lifelong Glass Top Gas Stove, 3 Burner Gas Stove, Black (1 year warranty with Doorstep Service) @ 57% Discount. Lifelong online is a part of a 25-year-old diversified Lifelong group. The company is committed to providing superior quality products across categories namely home, personal care, kitchen and wellness, at affordable prices. The Lifelong 3 burner gas stove gives you the perfect combination of efficiency and elegance. We know how long you spend in the kitchen, especially on weekday mornings, trying to prepare a number of tiffins and dishes. 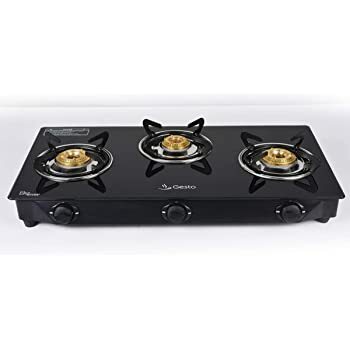 The 3 burners allow you to cook separate dishes easily, as the burners are spaced out well enough to give ample space to even large dishes side-by-side. The shatterproof glass top adds a touch of elegance to your kitchen, and is very easy to clean and maintain. Nylon coated burner knobs, anti skid feet, heat resistant burner plates. 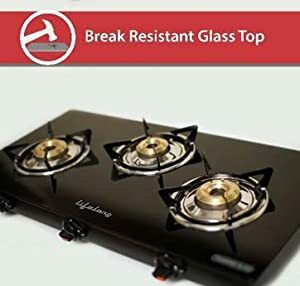 The top of the Lifelong 3 burner gas stove has a layer of break resistant glass, which adds a touch of elegance to your kitchen, giving it a modern finish. The toughened glass can withstand very high temperatures, and its elegant design makes it a perfect addition to your kitchen. 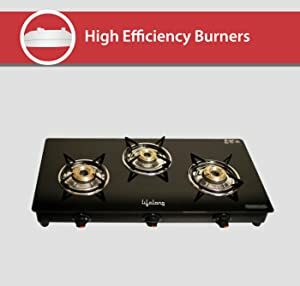 The burners consume less LPG and have a stronger flame than other gas stoves. Apart from being long lasting, they give your kitchen a premium look and feel. While stirring or applying high pressure to the dish, your stove is at the risk of shifting. Consequently the dish may get disbalanced and fall on you. 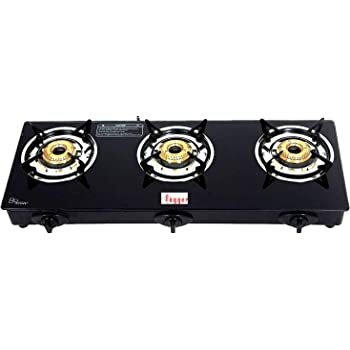 The Lifelong 3 burner gas stove’s antiskid feet ensure the gas stove remains stationary even when excess force or pressure is applied. This makes for a comfortable cooking experience each time. 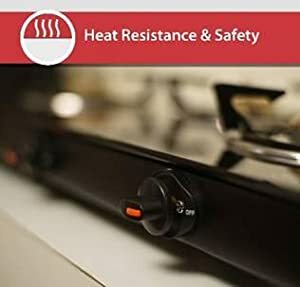 The 3 burner pans and nylon coated knobs can withstand high temperatures on a daily basis. The glass top is shatterproof and does not chip or crack when faced with extreme heat. All these features, combined with the anti skid feet, ensure risks like burning and dis-balancing are minimized. One of the greatest challenges while cooking is maintaining a clean kitchen. 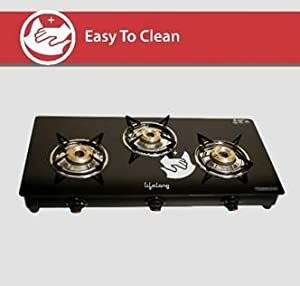 The Lifelong 3 burner gas stove can be cleaned very easily, simply by using a wet cloth. Now you can leave your kitchen as clean as when you started. 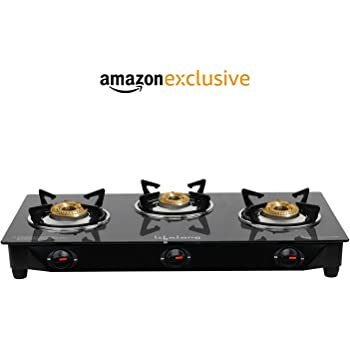 The burners of this gas stove are surrounded by thick pan supports. It offer great support to the pans which are placed on the burners for cooking. 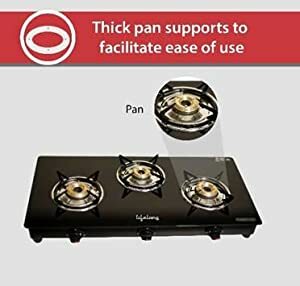 The purpose of these supports is to provide ample support at the base of the pan such that they maintain their balance on the stove and do not fall off easily; the thickness of these supports ensures that they serve purpose extremely well preventing any accidents which might occur in the kitchen. 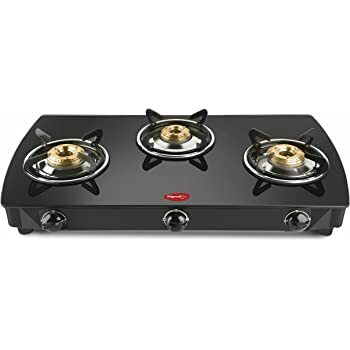 Lifelong gas stove with three burners is a highly efficient stove. The glass top is toughened to be shatter-proof. It looks elegant and adds charm to your kitchen. The burner stands are designed to be spill-proof, so you don’t have to worry about your vessels toppling over. The knobs are ergonomically designed for ease-of-use. Moreover, they are engineered to avoid leakage of gas to give you safe and efficient cooking experience. 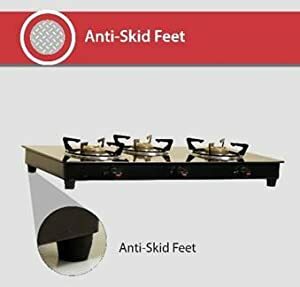 The compact design of the stove saves you a lot of counter-top space.